For de first time some people coming out and protest because dem don’t want to pay de parking meter fee. These are de same people who don’t even want to pay tax and dem wukking fuh more money that nearly all dem public servants. Some of dem got three houses and dem don’t even pay property tax, but dem is de same people who complain if dem garbage ain’t get pick up. Dem boys seh de other day when City Hall try to raise taxes pun de property, these very people go to court and block de council. All it mean is that these people intend to live free all dem life. When Jagdeo was in power he try to set a tax fuh some lawyers. To this day he ain’t get through. But de parking meter is another thing. People using de road and when it break up and full of potholes de same protesters does complain because dem claim how de road breaking up dem car. Yet dem don’t want to pay money to help repair de road. Dem boys know that parking meter is necessary but wha got everybody up in arms is de way how de Council do it. Chase and de King of de Council decide that de people got to tek wha dem serve. Well de people mekking dem realize that things don’t wuk so. And poor Soulja Bai get caught up. All of a sudden people believe that he got to step in. He didn’t step in when dem refuse to pay dem taxes and if he did do that dem woulda seh how he using he powers. 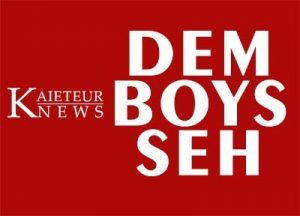 Dem boys seh is a case of damned if you do and damned if you don’t. Wha dem boys know is that bright and early de parking meters back in action. And dem boys waiting foh see wa gon happen. Talk half and hope that some people realize that nutten in life is free.